string(1203) "Resource Centre > Uncategorized > List of Goods Produced by Child Labor or Forced Labor – The 2016 List in Numbers"
The U.S. Department of Labor’s Bureau Of International Labor Affairs (ILAB) maintains a list of goods and their source countries which it has reason to believe are produced by child labor or forced labor in violation of international standards, as required under the Trafficking Victims Protection Reauthorization Act (TVPRA) of 2005 and subsequent reauthorizations. As of September 30, 2016, the List of Goods Produced by Child Labor or Forced Labor comprises 139 goods from 75 countries. 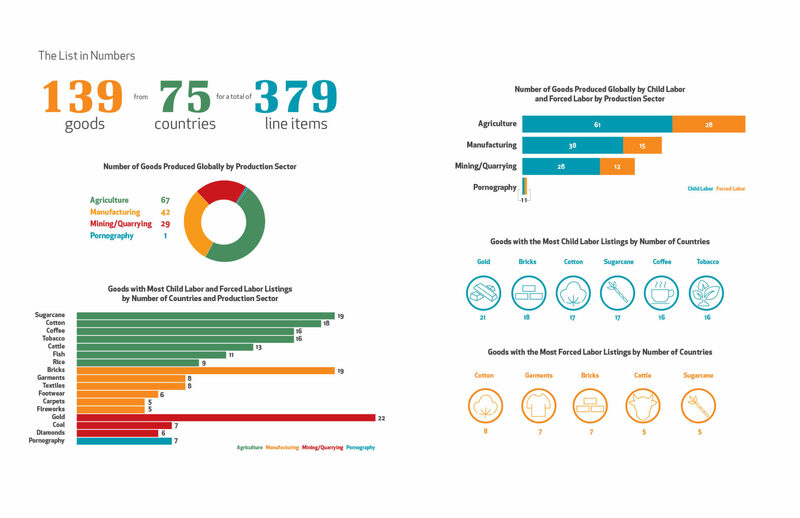 The List is a valuable resource for researchers, advocacy organizations and companies wishing to carry out risk assessments and engage in due diligence on labor rights in their supply chains. The countries on the List span every region of the world. The most common agricultural goods listed are cotton, sugarcane, coffee, cattle, rice, fish and cocoa. In the manufacturing sector, bricks, garments, carpets, and footwear appear most frequently; and in mined or quarried goods, diamonds, coal and gold.